Chip Somodevilla/Getty ImagesTrump and Musk both expressed their frustrations with Chinese import taxes on American cars on Thursday. President Donald Trump read a tweet from Tesla CEOElon Musk about Chinese import taxes on American cars during a signing ceremony for his steel and aluminium tariffs on Thursday. “For example, an American car going to China pays 25% import duty, but a Chinese car coming to the US only pays 2.5%, a tenfold difference,” the tweet read. Both Trump and Musk seemed to criticise the Obama administration for failing to address the import tax disparity. 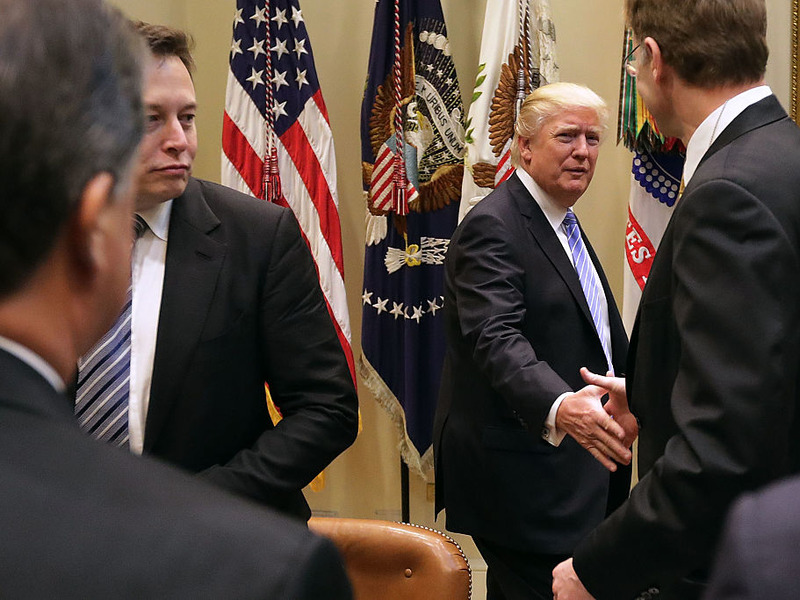 TeslaCEO Elon Musk responded to a tweet from President Donald Trump with a rant about China on Thursday. Hours after Musk’s tweets, Trump read one aloud during the signing ceremony for his steel and aluminium tariffs. “For example, an American car going to China pays 25% import duty, but a Chinese car coming to the US only pays 2.5%, a tenfold difference,” the tweet read. Trump was discussing the tariff bill and its possible effects when he read a printed copy of Musk’s tweet. After reading the tweet, he seemed to criticise the Obama Administration for failing to address the import tax disparity. Trump then said he wants to introduce a “reciprocal tax program” that would match import taxes levied by foreign countries on American goods. The tweet followed Musk’s initial message to Trump, where Musk asked Trump’s opinion of the disparity between the US and China’s vehicle import policies. “Do you think the US & China should have equal & fair rules for cars? Meaning, same import duties, ownership constraints & other factors,” Musk said. Musk also appeared to criticise former President Obama in his Twitter thread, claiming that “nothing happened” after he raised his concerns about China’s foreign car tariff with the Obama Administration. Before reading the tweet, Trump praised Musk’s space-exploration company SpaceX for doing a “great job” launching its Falcon Heavy rocket in February at Cape Canaveral Air Force Station in Florida. Musk has faced roadblocks while trying to build a Tesla factory in Shanghai. While Tesla wants complete ownership of its factory, China’s central government requires that Chinese companies have at least a 50% ownership stake in car factories built by foreign companies.